In 2002, the Hornady ammunition company created the .17 Hornady Magnum Rimfire, also known as the .17 HMR. It is a successor of the .22 Magnum and came to be by necking down the .22 Magnum case to take a .17 caliber cartridge. These are popular with most small game hunters and those wanting to rid their gardens and yards of unwanted vermin. The 17 HMR is light and accurate. They easily drop squirrels, pigeons, ruffed and blue grouse, rabbits, and magpies to name a few. They also make short work of raccoons, porcupines, rabbits, and coyotes if a head or heart shot lands. This is relatively easy because of the .17 Hornady Magnum Rimfire’s accuracy. Target shooters are also fond of the .17 HMR. Both groups agree that the accuracy improves a great deal with the addition of a scope. There are many scopes on the market, which work with the .17 HMR finding the one that is the best for the job can be challenging but with some helpful information, it becomes a manageable task. The first step in making a decision about a scope for the .17 HMR is deciding the purpose and the degree of accuracy that is necessary. Target shooting at the local range or on private property is an enjoyable pastime for many gun enthusiasts, in this situation accuracy of a scope is important, but probably not important enough to break the bank on a high-end scope. For fending off vermin or hunting small game, accuracy is important, especially if the target is quick or skittish. This very well may be the situation for an investment in a higher quality, higher priced scope. For either price range avoid scopes that feel flimsy or appear constructed with inferior quality materials. A trustworthy adage applies here; if the deal seems too good to be true then it probably is too good to be true. BSA Optics a company that specializes in the production of riflescopes, binoculars, and spotting scopes, manufactures this scope. 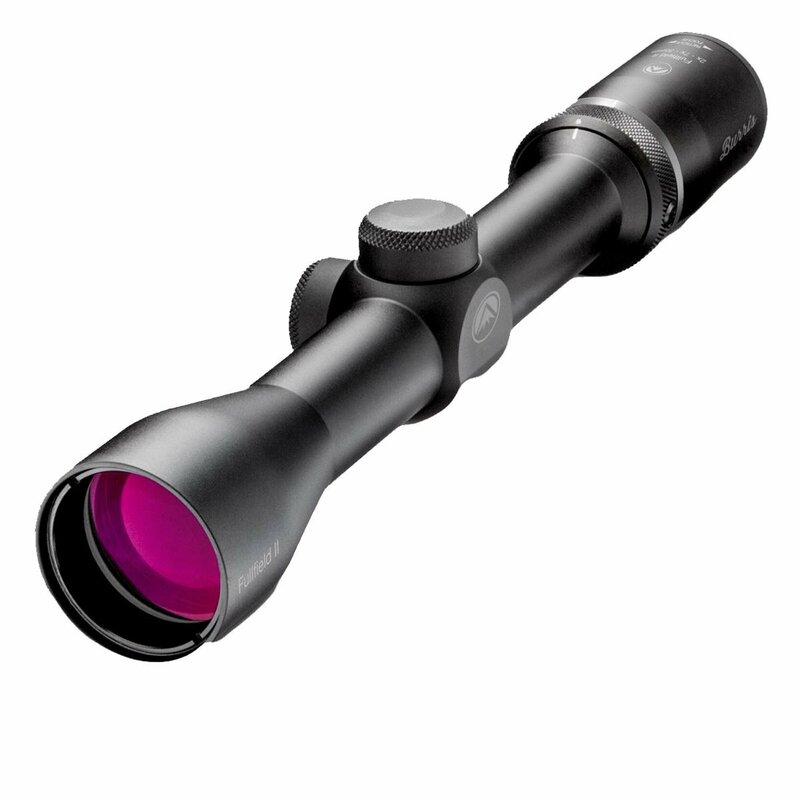 BSA is well known and highly regarded for the quality scopes they began producing in 1996. BSA Optics specifically designed their first scope for the .17 HMR in 2004. The BSA 3-12×40 Sweet 17 Rifle Scope is a favorite of small game hunters, who praise the accuracy and the reasonable price of this scope. BSA has packed a lot of quality into a small package with this scope. It is just 13.5 inches and it weighs 19.40 ounces. The scope features an efficient, specifically calibrated turret system that works well with multiple grain weights. The objective consists of 17gr turret drums and is adjustable. The 40mm objective lens gives a 100-yard look at the field. The BSA Sweet 17 Scope provides the shooter ideal eye-relief of 3inches, an adjustment range of 30-30, a quarter inch click adjustment, and a range of 10-infinity parallax setting. The scope is waterproof, fog-proof, and shockproof; it also comes with a limited lifetime warranty. The BSA 3-12×40 Sweet 17 Rifle Scope is a quality shooting accessory that is a great value. Barska is a sporting goods manufacturer that specializes in utilizing the latest optical technology and components. Barska excels at creating products known for exceptionally bright images. The Barska Hot- Magnum is 15.65 inches long, weighs just 20.48 ounces, and carries a limited lifetime warranty. One unique feature of this scope is that it is equipped with Bullet Drop Compensation technology or BDC technology. This can be particularly useful to those in target competitions as well as hunters. The BDC system works by having a reticle scheme that predicts how far a bullet will drop over a specific distance. This improves accuracy and efficiency when shooting over a variety of distances. The shooter simply lines up the target in the reticle that corresponds to the distance of the target and shoots. There is no need to adjust the elevation of the scope when the target distances changes. Bullet Drop Compensation technology is rapidly increasing in popularity as more shooters see its useful applications. The Barska Hot Magnum has a 40mm objective lens with 30/30 reticles. The lens adjusts easily to make parallax corrections. It provides eye relief of 3.1 inches as well as a click value of ¼. Barska has specifically calibrated the Hot Magnum scope for use with the .17 HMR. The scope also features an adjustable pre-calculated trajectory compensation allowing the shooter to fine-tune the scope within a range of 100-300 yards by simply turning a dial. The Banner Dusk and Dawn Riflescope has Bushnell’s sixty-five years of experience in producing dependable and affordable sports optics standing behind it. This riflescope is equipped with the exclusive Dusk and Dawn Brightness. This effect comes from a multi-coating method that gives vividness and precision that benefit small game hunters. The Dusk and Dawn Brightness allows hunters to make the most of every minute of the hunting day from first light until evening. In addition to the multi-coated optics, the Banner also gives the shooter 3.3 inches of eye- relief, has a convenient fast-focus eyepiece as well as a multi-X reticle. This combines to make it perfect for long range shooting. The Banner scope has a single tube design and a dry nitrogen filling making it fog- proof and waterproof. It is lightweight and compact; 12 inches long and weighs 15 ounces. Bushnell backs the Banner Dusk & Dawn Riflescope with a limited lifetime warranty. This is a great value for the small game hunter looking to extend the hunting day as long as possible. Simmons’ parent company, Vista Outdoor, manufactures the Pro Target TruPlex, and this worldwide maker’s thirty-plus years of experience in scopes and binoculars is easy to see. Sportsmen eagerly anticipate new products from Vista Outdoor because of the creativity and endurance Vista puts into their products. The ProTarget TruPlex is an ideal scope for small game hunting; it has a 3-9x magnification and it is remarkably easy to zero-in on a target using the adjustable turrets, which require just a fingertip to operate. The reticle assists with isolating targets of all sizes. The ProTarget TruPlex also features multicoated lenses for brilliant high-quality images with the objective of 40mm, side focus, and a generous 3.9-inch eye relief. The scope is 14.5 inches long and weighs 20.4 ounces. The Simmons ProTarget Riflescope is the scope every small game hunter needs. The Hawke Sport Optics brands make high quality, entry-level optics that will consistently hold up nicely and perform well. The Vantage HD riflescope is a truly versatile scope, which is equally effective in the woods or at the range. The layered optics have multiple coatings to ensure the proper dispersion of light for a well-defined image. Another unique feature to the Vantage-HD is the etching of the reticle into the lens. The illuminated lens gives the shooter the choice between five levels of intensity and Hawk Sport Optics takes the customizability one-step further by offering the choice of a red light for sunny conditions and a green light for dim light. This makes early morning or late evening accuracy easy. The Vantage HD features a fast focus feature on the eyepiece as well as a side focus of 10 yards to infinity. This scope gives objective of 40mm and a 4-12x optical system and the shooter has a consistent eye relief of 3.5 inches. The Vantage-HD is 13.6inches long and weighs 18.1ounces. It has a 1-inch monotube body that is constructed of durable lightweight aluminum alloy housing. Hawke Sport Optics augments by adding nitrogen filling to ensure the scope is waterproof and fog-proof. The Hawke Sport Optics Vantage HD 4-12X50AO Mil Dot IR Riflescope is a great value because its versatility and unique features will ensure years of diverse use. The ProStaff Riflescope is an example of Nikon’s cutting-edge technology and explains why Nikon is a worldwide authority in sports optics. This versatile scope works well for the range, but the features of the ProStaff shine while on a hunt for game. The 4-12x 40mm objective lens is multicoated and assures the shooter of sufficient brightness regardless of low contrast or low light surroundings by giving a 98% light transmission. Shooters appreciate the scope’s 3.7-inch consistent eye relief as well as the fact that the ProStaff scope has a zero-reset turret that allows the shooter the option of dialing up successive ranges. Nikon responded to consumer requests for a riflescope with a Bullet Drop Compensator, by equipping the ProStaff with a uniquely designed reticle made up of see-through ballistic circles. These give the shooter the advantage of maintaining distances once believed to be impossible. The ProStaff also holds an optional sunshade, which also offers ideal protection from rain, dust, and light snow. The housing of the scope is O-ring sealed and nitrogen-filled to protect it from water and fog damage. The length of the ProStaff riflescope is 14.1 inches and the scope weighs 16.2 ounces. It comes with a lifetime warranty and it is one of the highest rated mid-priced scopes on the market. Vista Outdoor created the Burris Fullfield II with the same care and attention to detail that they put into all of their sport equipment. This riflescope’s purpose is to last and outperform the rest of the market and Vista Outdoor backs it up with a warranty that will last forever. The scope has a multi-coated no-glare lens that provides the shooter unrivaled clarity and contrast even in inclement weather and in poor light conditions. The Fullfield gives the shooter an eye relief, which ranges between 3.1-4.1inches. It has a no-slip grip for the power ring and eyepiece making adjustments simple and quick. The scope has a ballistic Plex reticle and the Fullfield is waterproof, shockproof, and fog proof. It is extremely compact and portable weighing 12 ounces with a length of 11.4 inches. The Burris Fullfield II 2-7x35mm Ballistic Plex is rugged and will hold up under adverse conditions this makes it perfect for game hunting. It is a long term quality investment for the hunting enthusiast. With so many options at such a wide variety of price points, it is hard for a consumer to go wrong. For use on the range, the Barska 6-18×40 AO Hot Magnum is a wonderfully versatile moderately priced scope. The Hot Magnum’s Bullet Drop Compensation makes it ideal on the range or in shooting competitions. For use in the field, hunting various kinds of small game the Hawke Sport Optics Vantage HD 4-12X50AO Mil Dot IR Riflescope is an excellent choice. Its fast focus feature makes tagging small, quick game easy, the etched reticle, and the illuminated lens help hunters make the most of their day in the field. By adding, the red and green lights with five levels of light intensity Barska set this scope apart from similar models on the market. Purchasing a great riflescope for the .17 HMR can be easy and enjoyable, remember these tips and reviews to find the perfect scope.